Cell adhesion is one of the most important properties controlling embryonic development. Extremely precise cell-cell contacts are established according to the nature of adhesion molecules that are expressed on the cell surface. The identifica- tion of several families of adhesion molecules, well conserved throughout evolu- tion, has been the basis of a considerable amount of work over the past 20 years that contributed to establish functions of cell adhesion in almost all organs. Nowadays, cell adhesion molecules are not just considered as cellular glue but are thought to play critical roles in cell signaling. Their ability to influence cell proliferation, mi- gration, or differentiation depends on both cell surface adhesion properties and acti- vation of intracellular pathways. The next challenge will be to understand how these molecules interact with each other to ensure specific functions in the morphogen- esis of very sophisticated systems. Indeed, by exploring the cellular and molecular mechanisms of nervous system development, the group of H. Fujisawa in Japan identified in 1987 an adhesion molecule, neuropilin, highly expressed in the neuro- pile of amphibian optic tectum. 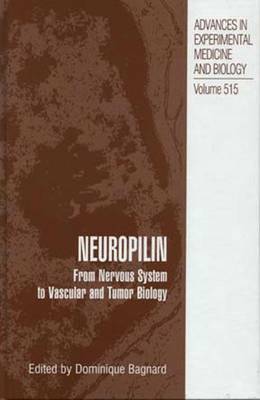 Ten years later, two groups discovered that neuropilin is a receptor for guidance signals of the semaphorin family. Axon guidance is a critical step during brain development and the mechanisms ensuring growth cone navigation are beginning to be well understood. The semaphorins are bifunctional signals defining permissive or inhibitory pathways sensed by the growth cone.